I crossed paths with Muhammad Ali at a book conference at the Anaheim Convention Center years back. The way his security detail — a large group of square, towering Black men — cut through the crowd was memorable. 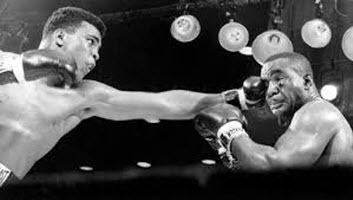 So was Ali’s charisma. Smiling, he had a kind of light around him, even in the chaotic, anonymous convention hall. I stopped to watch, but didn’t think to ask to take a picture. Today, everyone present would have posted something. More telling was a discovery I made a few years later at an estate sale in Oakland – really more of a clearance sale, emptying out a one-bedroom apartment after the elderly Black renter had passed away. Leafing through, I found other 1960s Oakland Tribune sports columns detailing triumphs by Rubin “Hurricane” Carter, Willie Mays and Willie McCovey. These stories had mattered to someone, so much so that he or she had saved them for more than fifty years – in the case of Jack Johnson, nearly a hundred years. I bought the box for a dollar or two. I still don’t know who lived in that apartment, but I got the family papers back to the descendants through a mutual friend who stopped by the sale. I offered the newspapers to the Oakland Public Library and gave them what they chose. The old editions, brittle and yellow, were not headed for circulation, but the library staff, obviously excited, said they would figure out how to use them. Maybe the newspapers that landed in that kitchen box ended up there accidentally, but it doesn’t seem so. The selection of stories struck me as personal, not part of a larger sports trove. The interleafing of family documents among the newsprint and the newspapers’ long survival suggested their importance. There was a whiff of “when we were kings” to that collection – and a sense of a personal connection with Ali and the other Black athletes whose achievements graced those pages. Even now, when I pass by that blue four-plex, I think about the pleasure and meaning that whoever used to live in that modest rental found in those triumphs.